Saturday June 21, 1902 I did cake baking early and went down to Pointers for gooseberries. I do not feel well & am having a spell of indigestion. Will went to town in the afternoon and Laura came home with him. I was busy all afternoon cleaning up the house. We visited till late bed time. weather quite cool. Sunday June 22nd 1902 We sat around the kitchen stove and talked all the forenoon when not busy with the work. I had dinner early and took Laura home. Will went with us as far as Woolfs. I do not feel well. Monday June 23rd 1902 The men were able to plow today. Will helped me in the forenoon and in the afternoon brought "Bess" down from the pasture with her little colt. I do not feel better. 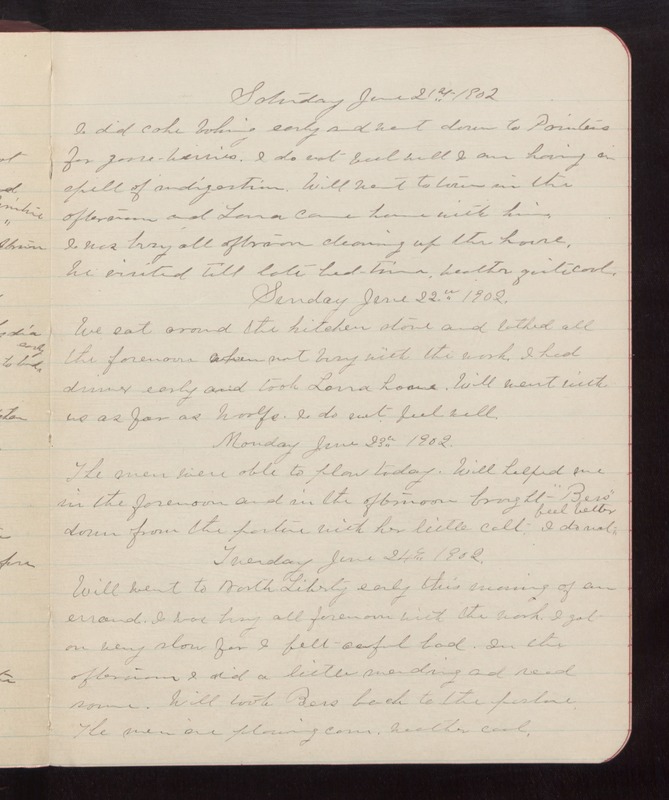 Tuesday June 24th 1902 Will went to North Liberty early this morning of an errand. I was busy all forenoon with the work. I got on very slow for I felt awful bad. In the afternoon I did a little mending and read some. Will took Bess back to the pasture The men are plowing corn. weather cool.